Problems with the water heater often sneak up on homeowners since they’re usually out of sight and work quietly. If yours isn’t providing the hot water you count on, the cause might be one of the conditions listed below. A tank-style heater needs to be flushed several times a year to avoid excessive hard water deposits from forming at the bottom of the tank. Hard water contains dissolved mineral solids that can form clumps over time. When they collect at the bottom, the heating process slows because the water deposits act as insulation. Get rid of the deposits by hooking up a hose to the bottom of the tank and draining off a few gallons several times a year. Be sure you follow the manufacturer’s directions to avoid harming yourself or the tank. 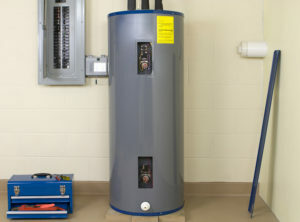 A water heater can lose heat if it lacks insulation inside it. If the tank feels warm to the touch, wrap it with an insulating blanket, available at home improvement centers. Be sure you select the right size and type. If you have a gas heater, ask a pro from Rinaldi’s Energy Solutions to install it for you to make sure it vents properly. Most electric water heaters have two elements. Over time, they can burn out, which can contribute to a lower water temperature. A plumber from Rinaldi’s can diagnose a failed heating element or ignition problems with a gas unit. The dip tube in the water heater sends incoming water toward the bottom of the tank for heating. If it breaks, the water won’t reach the bottom of the tank where it would be heated. Instead, it will lower the temperature of the water at the top and flow to your fixtures at a tepid temperature. The experts at Rinaldi’s Energy Solutions can help you diagnose a water heater problem and also help you avoid them altogether through maintenance. We provide HVAC and plumbing services for Orlando-area homeowners.